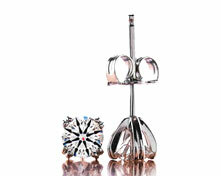 Brian Gavin Diamonds recently introduced its "Brian Gavin Blue" line of diamonds. The true beauty of Fluorescence in a diamond coupled with Brian Gavin's proven track record and strictly designated parameters, allows you to own a spectacular and brilliant diamond at a competitive price. What Exactly is Fluorescence and Why Should it Matter to Me? Many diamonds release a visible light called fluorescence when placed under ultraviolet (UV) light - typically a black light, like those found in nightclubs. Under such conditions, fluorescence can be seen in about 1/3 of diamonds. Fluorescent colors include orange, yellow and white, however the most common fluorescent color in diamonds is blue. There are 2 sides to every coin, and the effects of fluorescence in a diamond are no different. In some cases, fluorescence positively affects diamonds making them appear whiter than their true color grade when exposed to UV elements. In others cases, fluorescence can cause the diamond to have a "milky" effect and/or affect the brightness of the diamond. Brian Gavin Blue diamonds are not negatively affected at all by fluorescence. Brian Gavin is a fifth generation diamond cutter, who learned the ins and outs of the diamond business in his family's diamond factory in Johannesburg, South Africa, which is a world capital when it comes to ideal cut diamonds. Brian's diamond savvy can be your gain. His new "Brian Gavin Blue" line of diamonds contains medium to strong blue fluorescence. Brian carefully and meticulously inspects each one of these diamonds to make sure that the fluorescence has no negative effect on the diamond's performance whatsoever. Each one of these top performing stones has been Cut to super ideal proportions. What is The "Blue" Criteria? The industry prejudice regarding fluorescence makes these diamonds trade at a slightly lower price point, and Brian is more than happy to pass these savings along to you. Brian's "Brian Gavin Blue" line of diamonds basically allow you to become a diamond buying insider; taking advantage of the diamond business itself by getting a great deal on a diamond that may have otherwise been criticized by the industry. Brian Gavin's expertise allows you the opportunity to own super ideal diamonds cut to Brian's strict performance standards at more competitive pricing. If you wish to learn more about Fluorescence and its Effect on Diamonds - Click here to read/download a pdf of the GIA's research on the topic. Our customer, Brian Gallardo, created this fantastic video showing his new Brian Gavin Blue diamond in different lighting conditions. 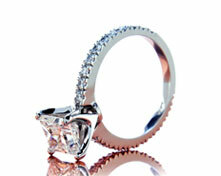 The diamond will be set into a custom Brian Gavin engagement setting which we will feature when it is done.